WASHINGTON—Armenian Americans and their allies from across the Greater DC area rallied in front of the White House on Saturday to urge President Trump to end U.S. complicity in Turkey’s Armenian Genocide denial by clearly and unequivocally condemning that crime in his annual April 24th commemorative statement. The candle-light vigil was organized by the Washington, DC Armenian Youth Federation “Ani” Chapter, in coordination with a coalition of Armenian American groups comprising the Armenian Genocide Commemorative Committee of Greater Washington. Two Armenian schools from Southern California – Mesrobian Armenian School and AGBU Manoogian Demirjian School – participated in the solemn commemoration. This year’s vigil also spotlighted the unprecedented U.S. humanitarian assistance efforts of Near East Relief, a Congressionally mandated campaign which, from 1916-1930, raised the equivalent of over $2.5 billion in today’s currency to assist some 137,000 orphans and over a million Armenian, Greek, Assyrian, Aramean, Chaldean and Syriac survivors of the Genocide. Throughout the program AYF members Aram Najarian, Kristine Antanesian, Sune Hamparian, Mari Tikoyan, and Galy Jackmackjian highlighted the statewide efforts of Alabama, California, Mississippi, New York, and Virginia by outlining specific cases of local organizing and charity work conducted by the American public to aid refugees. Additional states will be honored each year at subsequent vigils. Georgetown Armenian Student Association President and AYF member Nareg Kuyumjian shared a poetic and powerful Palm Sunday-eve Armenian language message, noting, in part, that United States’ monumental Near East Relief effort stands in stark contrast to today’s White House policies. “We stand in front of a White House whose silence in the face of the Armenian Genocide, fails to acknowledge our own proud past,” stated Kuyumjian. “The time has come for the Armenian American youth to engage within the halls of power to reform the system from within,” continued Kuyumjian, issuing a call to action for greater Armenian American youth civic participation. Mesrobian Armenian School eighth graders reciting “Menk Khaghagh Eyink” by Hovannes Shiraz at the White House Vigil commemorating the Armenian Genocide. 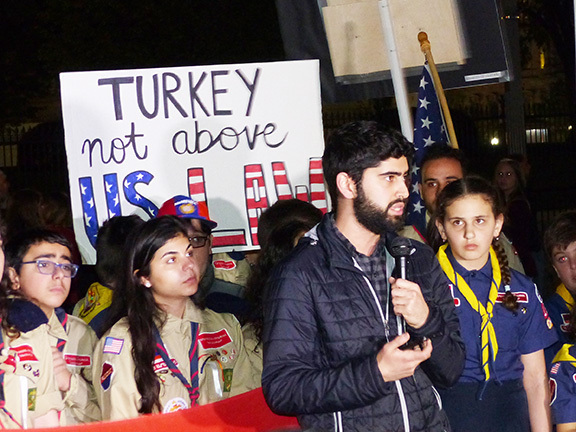 “The time has come for the Armenian American youth to engage within the halls of power to reform the system from within,” argued Kuyumjian, in remarks offered in Armenian during the White House Armenian Genocide Vigil. Fr. Sarkis Aktavoukian, pastor of the Soorp Khatch Armenian Church in Bethesda, MD, led the crowd in prayer in honor of the sainted martyrs of the Armenian Genocide at the 2019 White House Vigil for Armenian Genocide justice. AYF San Fernando Valley Sardarabad Chapter Executive Member Mikael Matossian spotlights ongoing Congressional efforts to set a permanent U.S. policy of Armenian Genocide remembrance, the groundbreaking California student-led campaign to divest from Turkey, and efforts of Armenians in present-day Turkey to secure acknowledgment of the Armenian Genocide in his remarks at the White House Armenian Genocide vigil. Over 300 from across the U.S. joined the Washington AYF Ani Chapter at the annual White House candlelight vigil marking the Armenian Genocide. AYF San Fernando Valley Sardarabad Chapter Executive Member Mikael Matossian addressed the crowd with the English Message of the Day: “I call on you to join me in calling on President Trump to recognize this thoroughly documented event in human history as what it is – genocide. But I also ask you to join me in using his deafening silence on the topic as motivation to keep up the fight. Let it fuel your own desire to keep up the fight for the recognition and reparations we deserve – whether that be politically or culturally, through personal or organizational means – and continue the march for justice.” Matossian discussed ongoing Congressional efforts to set a permanent U.S. policy of Armenian Genocide remembrance, but also called special attention to the groundbreaking California student-led campaign to divest from Turkey and efforts of Armenians in present-day Turkey to secure acknowledgment of the Armenian Genocide.